All of Petra’s operations are mining ‘hard rock’ kimberlite pipe diamond orebodies, as opposed to alluvial deposits (i.e. deposits of diamonds which have been removed from the primary kimberlite source by natural erosive action over millions of years, and eventually deposited in a new environment such as a river bed, an ocean floor or a shoreline). Petra is employing open pit mining at the Williamson mine in Tanzania and the Ebenhaezer satellite pipe at Koffiefontein in South Africa. Mining of a diamond-bearing kimberlite generally starts with the excavation of a pit into the kimberlite pipe. In this process, called ‘‘open-pit’’ or ‘‘open-cast’’ mining, the initially weathered ore material is removed with large hydraulic shovels and ore trucks. Hard rock is drilled and blasted with explosives so the broken material can be removed. Open pits are excavated until the strip ratio (the amount of host rock that must be stripped away in order to access new ore) becomes prohibitive to the mine’s operating cost. At this point, the operator will evaluate making the transition to underground mining. Cave mining (both block caving and sub-level caving), which is currently used at Petra’s underground mines in South Africa is a well-established and safe mechanised mining method that was first introduced at Kimberley, South Africa in 1951. It is now used extensively as an underground mining method as it allows for the bulk mining of large orebodies and enables a higher ore extraction percentage compared to other underground mining methods. It can be applied to mine massive orebodies which have large, regular “footprints” and either dip steeply or are of large vertical extent. The method works by first delineating a new block or level of ore to be mined. An ‘undercut’ zone is driven through the orebody, which is then drilled and blasted progressively in order to create a void into which initial caving of the overlying ore can take place. The kimberlite orebody is inherently weaker than the host rock and will start to collapse into the void, breaking and grinding into smaller and smaller pieces which can then be extracted from a large number of drawpoints which have been set up across the orebody. As more broken ore is drawn progressively following cave initiation, the cave propagates upwards through the orebody or block until the overlying rock also caves and surface subsidence occurs. The mechanisms by which caving takes place under the influence of redistributed stresses and/or gravity are extensively studied and well known. The broken ore is removed through the production or extraction level developed below the undercut level and connected to it by drawbells through which the ore gravitates to drawpoints on the extraction level. In most current block caving operations, the broken ore is removed from the drawpoints by LHD vehicles, although the Kimberley Underground mines still use the more traditional gravity-based grizzly or slusher systems. From the extraction level, the ore is transported to the haulage level and out of the mine, sometimes following underground crushing. 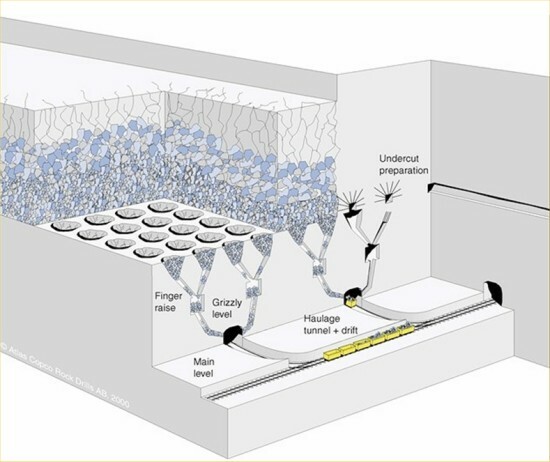 By drawing continually from the drawpoints in a set sequence, the caving process can be controlled and set up to last over a significant mine plan (typically over 10 to 20 years, being mostly dependant on the height of the block). Once the majority of ore has been removed from the block, dilution will occur due to waste rock from the side walls or remnants of the open pit above falling into the drawpoints alongside the kimberlite ore. Eventually the block of ore will be exhausted entirely and the operator typically evaluates making the transition to a new mining block. See Moving to Undiluted Ore for more information on this. It is initially a capital intensive process, requiring considerable investment in infrastructure and development before production can commence. However, once the caves have been propagated, it is a low cost mining method which is capable of automation to produce an underground ‘rock factory’. This method owes the first part of its name to the fact that work is carried out on intermediate levels (that is, sub-levels) between the main production levels. It follows the same basic principles as the block caving mining method, but the caves are smaller in size and not as long lasting. This method of mining is quicker to bring into production than block caving, as the related infrastructure does not require the level of permanence needed for a long-term block cave. However, the operating costs are slightly higher, as more drilling and blasting is required. Petra utilises this mining method to supplement block caving, in order to provide production flexibility. For example, at the Finsch mine sub-level caving is being used as part of the mine’s expansion programme to maintain underground production levels during the transition from the Block 4 cave to the Block 5 cave.